| 1mL LB is maintained at 37℃, usually for 3 h.
| 50mL 2xYT is maintained at 37℃, usually for 4-5 h.
Harvest the cells at OD = 2 to 3. ※If OD does not reach to 2-3, incubate overnight at 37℃. Next day, transfer 1mL overnight culture into another 50mL 2xYT and incubate at 37℃ for several hours. ※We measure the OD by UV-visible spectrophotometer V-650 (JASCO corp.). Centrifuge at 5,000xg for 10min at 4℃. Wash in 50mL ice-cold Milli-Q water. Centrifuge at 5,000xg for 5min at 4℃. Resuspend gently in 1.2mL CelLytic B Cell Lysis Reagent (Sigma, B7435) (ref.2). ※Alternatively, buffers containing Triton X-100 can also be used (ref.3, ref.4). Incubate it for 10min at room temperature. ※Leave to stand, not rorate. Centrifuge at 20,000xg for 2min at 4℃. Place the supernatant on ice and add 1 volume of ice-cold 80% glycerol (v/v). Aliquot 40uL of each SLiCE extract into a 0.2mL-PCR tube. Snap-freeze in a bath of liquid nitrogen. Maintain this stock solution at -80℃ (for use, 40uL each extract in 0.2mL 8-strip PCR tube). ※SLiCEs can be stored at -80℃ for at least three years without significant loss of activity. ※For short-term storage, SLiCEs are stored at -20℃. ※SLiCEs can be stored at -20℃ for 2-3 months without significant loss of activity. If multiple bands were amplified by PCR, the PCR fragments should be purified by agarose gel electrophoresis. ※Excess insert DNA inhibits the SLiCE reaction (ref. 4). ※A SLiCE reaction for 15 min results in enough cloning-efficiency, in many cases. 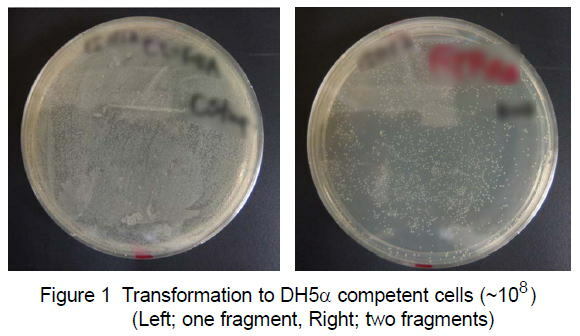 ※DpnI treatment efficiently reduces background colony formation. 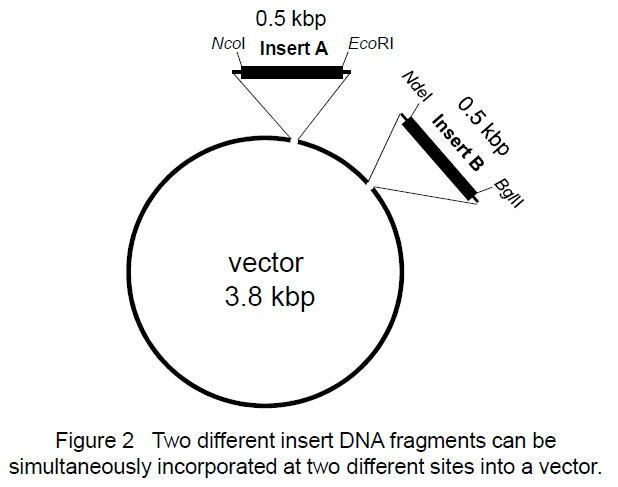 ※When a restriction enzyme-digested vector is used, DpnI should be inactivated for 15 min at 80°C. for QuikChange site-directed mutagenesis kit. 19:00 Plating on LB plate. ref.1) Zhang, Y. et al., Nucleic Acids Res. vol.40, e55 (2012). ref.2) Motohashi, K., BMC Biotechnol. vol.15, 47 (2015). 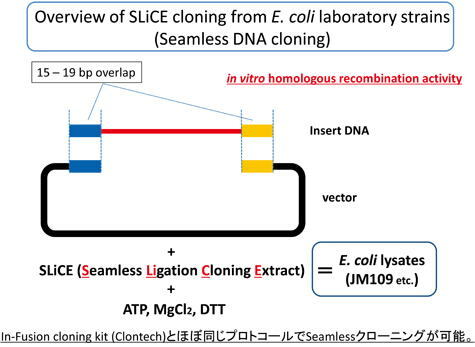 "A simple and efficient seamless DNA cloning method using SLiCE from Escherichia coli laboratory strains and its application to SLiP site-directed mutagenesis"
"Evaluation of seamless ligation cloning extract (SLiCE) preparation methods from an Escherichia coli laboratory strain"
"A simple and ultra-low cost homemade seamless ligation cloning extract (SLiCE) as an alternative to a commercially available seamless DNA cloning kit"
"Seamless Ligation Cloning Extract (SLiCE) method using cell lysates from laboratory Escherichia coli strains and its application to SLiP site-directed mutagenesis"
"Evaluation of the efficient and utility of recombinant enzyme-free seamless DNA cloning methods"
Copyright (C) 2012 Ken MOTOHASHI All Rights Reserved.